When it comes to buying a multi-million-dollar business jet, it’s important to make sure you get the best value for your money. Should you invest in a modern business jet with all the latest technology and cabin comfort, or should you opt for a pre-owned model at a lower acquisition cost? The right option is contingent on numerous considerations, but whatever the ultimate decision, Bombardier Business Aircraft has a solution to meet the needs of all aircraft buyers, whether they choose to purchase a new or pre-owned business jet. It’s generally accepted that new aircraft cost more to acquire and pre-owned aircraft cost more to operate. So which is the better option? Comparisons are complex and each buying scenario is unique, but you might be surprised to learn that, beneath the sticker price, there are many lesser-known cost advantages to buying a brand-new business aircraft. In this article, we’ll look at some of the main factors to consider when assessing your acquisition costs and why, when you factor in the many financial and value-added benefits of buying a new aircraft, the price gap between new and pre-owned business jets might be a lot narrower than you think. Buying a used aircraft certainly appears tempting. As with many things however, the sticker price does not always represent the true cost of ownership. Of course, it’s hard to place a value on the prestige, polish and performance of a brand-new aircraft customized to your specifications and equipped with the latest technology. To quote a well-known advertising tag line, it’s priceless. That said, there are several easily quantifiable factors that substantially narrow the gap between the two options. Operating costs are a main one. New jets are more reliable and come with a full warranty, which naturally helps to reduce the overall operating costs in the first five years of operation. Moreover, as an aircraft ages, it generally requires more thorough inspections and more preventative maintenance. Once the warranty expires, operating costs rise. Canadian business jet manufacturer Bombardier sells both new and pre-owned aircraft and with increased customer support and availability of parts worldwide, offers the highest-quality service to owners and operators of new and pre-owned aircraft. As the OEM, we learn from each platform to optimize and enhance availability and uptime on new aircraft. Newer aircraft have the benefit of optimized maintenance intervals stemming from an OEM’s drive to continue to improve its products. This means lower maintenance costs and less time not flying with your business jet. Maintenance intervals on Bombardier’s newer Global 6000 model have evolved to 50% longer than its predecessor the Global Express XRS, for example. Therefore, the out-of-warranty maintenance cost of a 5-year old Global can be up to 60% higher than that of a new Global aircraft. Bombardier has also implemented enhancements to older aircraft to provide customers with new upgrades to enhance the performance, comfort and operating costs—but, if you are in a position to buy new, the benefits associated to owning a new business jet can put you ahead of the game. It’s also important to factor in the fixed costs that must be considered with the purchase of a new or pre-owned aircraft. “When weighing their options, prospective customers should give consideration to the extensive support for entry-into-service offered by the OEM, along with assistance with resale of an existing aircraft, both which minimize headaches and save you money,” explains Michael Gelpi. These services can include the initial training of pilots, mechanics and, for larger jets, flight attendants, in addition to field support for pilots. Such services can add up depending on the model. At Bombardier, for example, a delivery team of avionics technicians, cabin interior experts and maintenance specialists accompanies each delivery of a new aircraft to ensure a seamless entry into service, while on-site customer liaison pilots offer hands-on flight support and quick response to operational issues. In private transactions, these support costs are born by the buyer. Like elsewhere in society, technology is advancing apace and new avionics and cabin technologies are setting an ever-higher standard in business aviation. Improvements, such as Head-up Display and advanced vision and weather radar systems, offer the best in state-of-the-art avionics, while business aircraft operators consider new Ka-band high-speed in-flight Wi-Fi connectivity a top priority. As a leader in the industry, Bombardier originated the Ka-band high-speed connectivity offering on its new Global and Challenger 650 aircraft and as a retrofit on Challenger 604 and 605 aircraft models. Hangars across the country are filled with older jets modernizing their avionics and cabin technologies. The cost of bringing a pre-owned aircraft up to standard can be considerable, but may be well worth the added price tag and, some regulatory updates, should be factored into the overall acquisition cost of a used aircraft. That said, such upgrades add value to your asset and part of the cost can generally be recovered on resale. As for purchasing a business jet, there are many ways to go about buying an aircraft – financing, leasing, paying cash, etc…. Perhaps one of the most appreciable impact on the new-versus-used price gap is specific to financing arrangements. Here there are a multitude of variables that could affect the bottom line. There are also important differences when it comes to resale. New aircraft tend to hold their value while the value of out of production models drops off more sharply once a replacement has been announced. Yet, Bombardier’s pre-owned Global aircraft, particularly younger aircraft regularly outperforms all direct competitors in the large category – in terms of change in inventory levels and depreciation over time. Tax depreciation can also impact cash flows and total costs. New aircraft benefit from a 50% bonus tax depreciation, reducing your company’s tax burden and freeing up significant cash flow. This bonus tax depreciation, based on current legislation and currently in effect for 2017, will decrease in the following years. The legislation, however, is open to change at any time under the new administration. 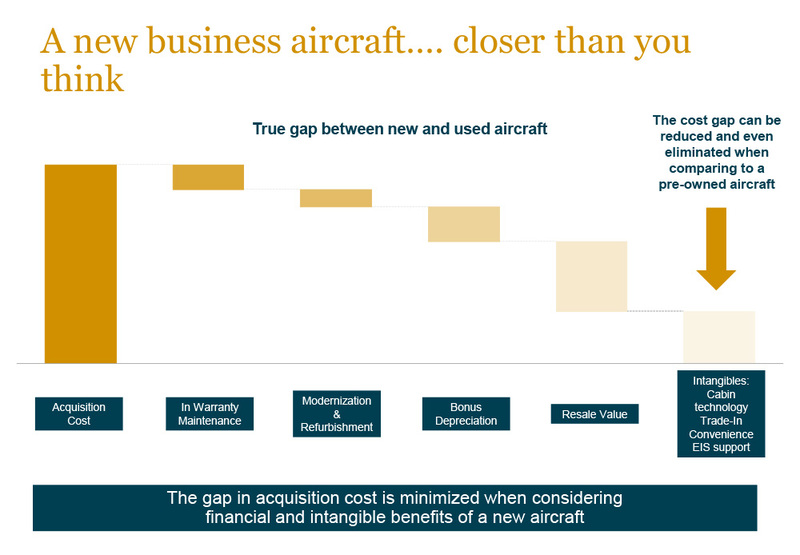 Taking each of these factors in consideration, it’s easy to see that real cost gap between new and used aircraft is much narrower that their initial purchase price would indicate. Whichever scenario is best for you, Bombardier can offer a tailor-made business aircraft solution to meet your needs. But perhaps the greatest advantage of buying a new aircraft has little to do with price. It’s hard to beat the thrill of boarding your sparkling new jet and settling into the technology and comfort of something like the new Global 6000 Premier cabin interior. Surrounded by hand-stitched seats, intelligent ergonomics, an advanced cabin management system and the industry’s fastest Ka-band in-flight Wi-Fi connectivity… Priceless!